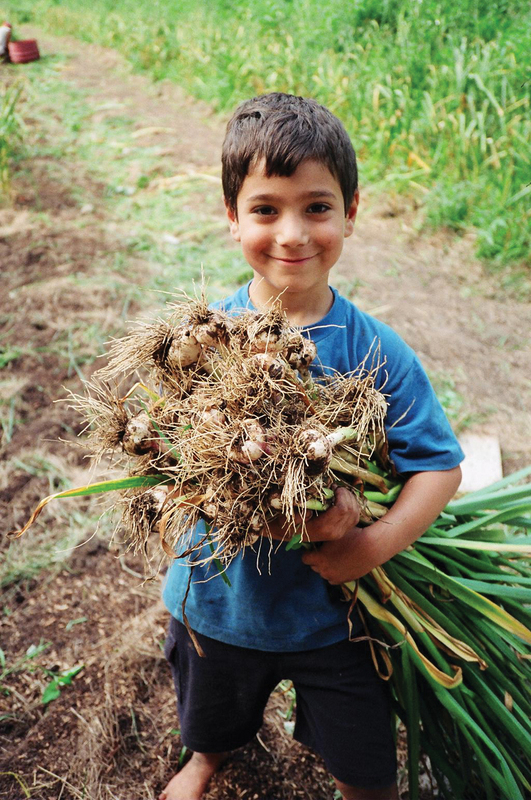 The first North Quabbin Garlic and Arts Festival was held in 1999 at Seeds of Solidarity Farm. The week before the first festival, a hurricane came through and the neighbors showed up with tractors, gravel, whatever was necessary to ready the field and prepare for whatever crowds might show up. And they did, almost 1,000 strong – many shuttled in by a rented school bus from a local school parking lot, others by foot from nearby fields on Chestnut Hill Road which had been offered by neighbors for parking. In 2000, we moved the festival down the road to historic and more spacious Forster’s Farm, where it continues to be held. The festival has become a hugely popular, family friendly event that embodies the spirit of community building, environmental sustainability and artistic vitality. It is still organized by neighbors, with ample volunteerism and ingenuity. Everyone involved – organizers, exhibitors, volunteers, performers, attendees, a supportive community – makes the festival what it is and we are grateful and look forward to celebrating the richness of our communities for many years to come.